Adobe’s annual update to Photoshop Elements, its consumer image organizer and editor, offers a satisfying array of new features. 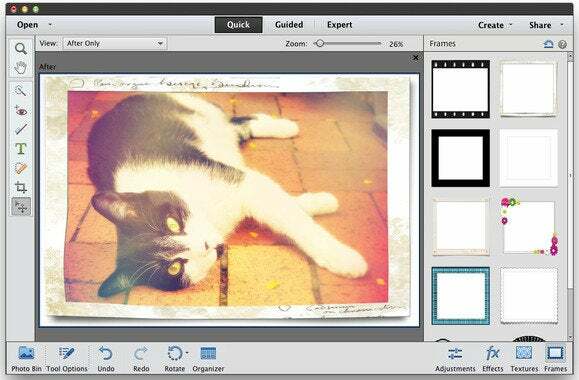 While changes in version 12’s Organizer focus on syncing and sharing photos for access on mobile devices, the Elements 12 Editor includes slick Instagram-inspired effects, textures, frames, new guided edits, and a content-aware move tool. Even more exciting is an intuitive image-correction method that remembers how you use it and a red-eye tool that works on animals—two features that even its flagship sibling Photoshop CC doesn’t have. One huge challenge in mobile photography is getting images off of your device. In version 12, the Elements Organizer lets you create mobile albums with Adobe Revel—a free online storage, syncing, and sharing utility, similar to Apple’s iCloud and Photo Stream. The free Revel iOS app also includes handy editing abilities. A Revel account gives you unlimited photo imports for one month, and 50 photos per month thereafter (a $6 monthly fee gives you unlimited imports). You can import photos into Revel and create mobile albums on your iOS device or in the desktop Elements 12 Organizer; you can then share automatically, sync between them, and share them via email. The album is viewable in a Web browser (on a pleasing, but uncustomizable grid on a black background) in the invitee’s own Revel account or Elements 12 Organizer—a great way to share vacation photos. You can share single images via social media, with Twitter a welcome new addition. Rounding out the upgrades to the Organizer is the ability to see Places and Event tags in the Tags/Info panel. You just drag and drop a tag onto an image to apply it; and in Places view, you can click a location on the map and choose Show Media to see just those photos. 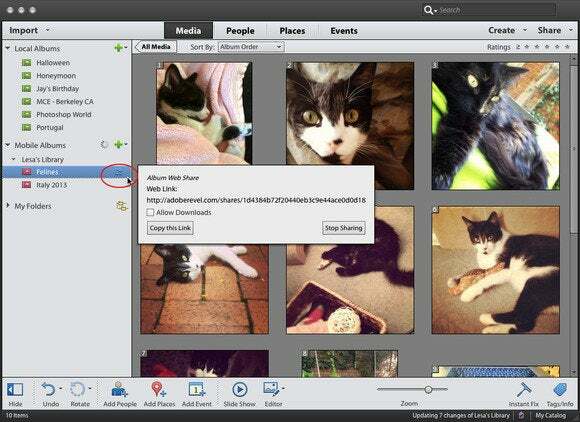 Once you share a mobile album, others can add, edit, and even download photos (if you granted permission to do so when you shared the album), though only the person who uploaded a photo can delete it. In the Adobe Elements Editor’s Quick mode, you’ll spot three new buttons at the bottom right of the window: Effects, Textures, and Frames. Applying these Instagram-style treatments is a single-click affair, though clicking the single Reset Image button at the top of these panels removes all the effects, textures, or frames that you’ve applied. To undo specific effects, you have to click into each panel separately and then click Undo from the Action Bar. It’s a little awkward. In Quick mode, you can create Instagram-style treatments using the new Effects, Textures, and Frames buttons (the Light Leak effect and Aged frame are shown here). Click and drag a photo to reposition it within the frame. Switch to Guided mode and you’ll find three new step-by-step techniques: Zoom Burst Effect (for simulating motion), Puzzle Effect (for creating a puzzle out of your photo), and Restore Old Photo. That last one walks you through a complicated series of tasks including cropping, using the Spot Healing Brush, the Healing Brush, Clone Stamp tools, Dust Removal (which triggers the Dust & Scratches filter), Auto Levels, Auto Contrast, Auto Color Correction, conversion to black-and-white, and sharpening. Whew! The new Puzzle Effect guided edit lets you choose the puzzle-piece size, as well as select and extract individual pieces. When you’re finished extracting pieces, you can switch to Expert mode, activate the layer of an extracted piece, and use the Free Transform tool to rotate it. Take a peek in the Enhance menu, and you’ll find a new Auto Smart Tone feature for automatic lighting and contrast corrections. Using a unique, on-image interface, you can fine-tune the autocorrections by clicking and dragging a joystick controller in the direction of a corrected image thumbnail (they’re positioned at each corner of the dialog box). By dragging the joystick toward a thumbnail, you apply more of that particular correction. If the object you want to move has free space around it, and you don’t move it very far, the Content-Aware Move tool works well. That said, you may need to do some cleanup with the Clone Stamp tool. Last but not least, photographers will appreciate the File menu’s new ‘Open in Camera Raw’ command for opening supported file formats in the Camera Raw plug-in; and, happily, you can now delete layers by pressing the Delete key on your keyboard. The new Auto Smart Tone feature is intuitive: It remembers how you fine-tune corrections in order to apply them the next time you use the feature. The interface also includes a handy Before/After switch at the bottom left. 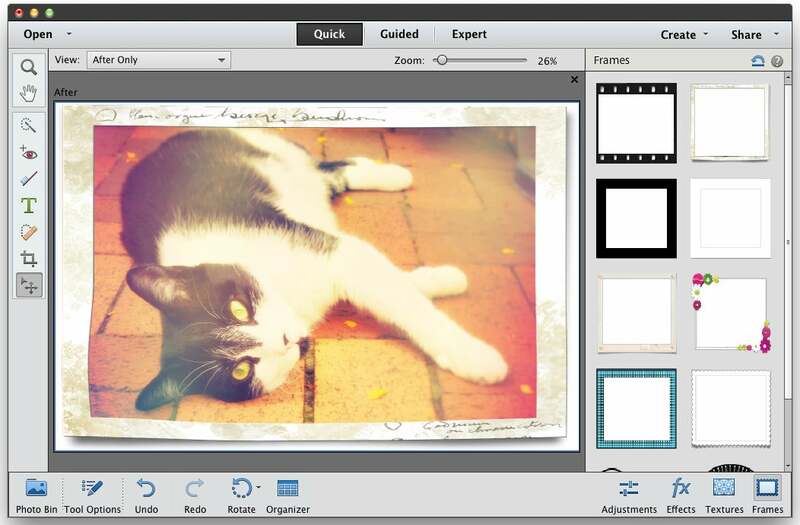 Family memoirists will love the Restore Old Photos guided edit, while the Auto Smart Tone feature saves time for the snap-happy. Fixing a pet’s eyes and repositioning items in a photo is highly useful, and the former is unique to this program. iPhonography fans will dig the mobile albums, and scrapbookers will adore Effects, Frames, and Textures. If you use Elements regularly, this upgrade is worth the money; if you’ve outgrown iPhoto, then Photoshop Elements 12 is the next logical step.